Twiplomacy - How Are World Leaders Connected? How well are our world leaders connected? 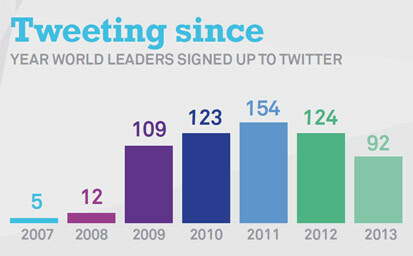 Twiplomacy answers these questions thanks to the magic of data visualisation. UX Passion has teamed up with our friends from Burson – Marsteller, one of the world’s leading PR agencies with offices in more than 50 countries all over the world. While the Burson – Marsteller team led by Matthias Luefkens (Head of the Digital Practice for Europe, Middle East and Africa) was in charge of data analytics and gathering, the UX Passion team was asked to come up with a simple, effective and scalable solution for data presentation and management. We developed our own data import tools and created a custom back-end solution for simple and effective data entry and management. We also built the entire solution in WordPress in close cooperation with the Burson – Marsteller design team in London. We analysed and imported 8712 data points from 264 profiles with more than 800 different visuals. From Twitter to Excel, then to WordPress and finally to the entire world, we’ve embraced Big Data and stepped up to the challenges. The results of the study itself are quite revealing. While the social network invites direct interaction between users, few world leaders take advantage of this opportunity to develop connections. Almost half of the world leaders analysed don’t follow any of their peers. A quarter of world leaders and governments follow President Barack Obama and the White House, but @BarackObama and the @WhiteHouse have established mutual Twitter relations with only three other world leaders: Norway’s Jens Stoltenberg, the UK Prime Minister and Russia’s Dmitry Medvedev. European Union President Herman van Rompuy (@euHvR) is the best connected world leader with 11 mutual follows. Australian Prime Minister @JuliaGillard is the second most connected world leader. Many governments use Twitter as an automated news feed from their website or Facebook page. As of 1 July 2012 the 264 accounts enjoyed a combined following of 51,990,656. One of the more surprising results was that physical tweet-ups are not only organized by Barack Obama who invited four lucky followers to have dinner with him, but also by the Croatian government, which regularly invites 50 followers for a government tweet-up. Looking for more? 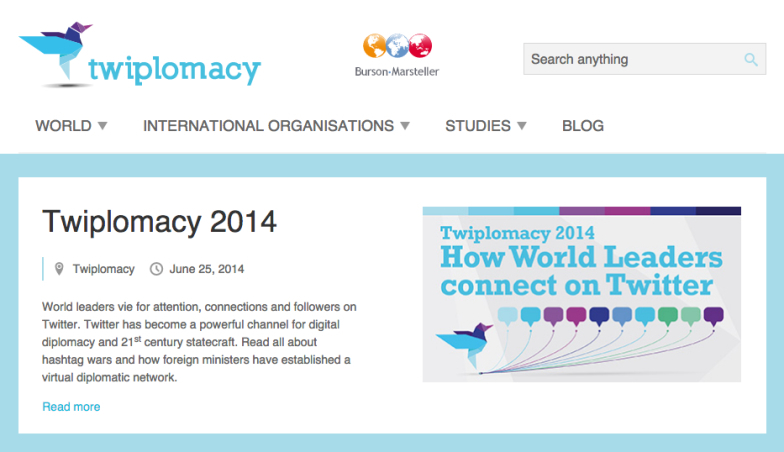 Explore Twiplomacy.com and enjoy! UX Passion loves music and SAWA!